For me the holiday season begins with that first scent of fresh cut evergreens. I remember when I was in the retail nursery business how that wonderful fragrance filled the greenhouses after a truckload of cut trees had been delivered. Their sharp, clean aroma was a signal that it was time to start celebrating the season. The Christmas tree has an interesting history that goes back at least as far as the Middle Ages. Then it was referred to as the Paradise Tree and it was simply adorned with large red apples, a symbol of the Feast of Adam and Eve, which was celebrated on December twenty-fourth. As the tradition evolved, lights were added and later the custom spread from Germany to this country. Before 1950 most of us cut our Christmas trees from the forest, but since then over ninety percent of them are grown and harvested from Christmas tree farms. For every tree cut on these farms, two to three seedlings are planted, making Christmas trees a renewable resource. Another remarkable fact is that over a million acres of Christmas trees are grown annually and that produces enough oxygen for eighteen million people. If you purchase a cut tree this year, there are a few things you can do to help keep it fresh during the holidays. First, re-cut the trunk as soon as you get it home. If you’re not ready to put it in the stand immediately, just set it into a bucket of water. Once you get it inside, it’s important to give it plenty of water. A fresh cut tree can drink up to a gallon of water in the first twenty-four hours after you bring it in and several quarts after that. If you find it difficult to get water in the stand without getting your packages wet, a simple solution is to place a few ice cubes in the stand. Of course, keeping your tree away from sources of heat such as vents and fireplaces will also help it to stay fresh longer. Keep in mind that lights on your tree are also a source of heat. The longer you leave them on, the quicker your tree will become dry. And it’s always a must to unplug them if you’re going to be away or before you go to bed. If you are one of those people who wish they could leave their holiday decorations up year round you should consider purchasing a live Christmas tree. You can plant it in the garden and celebrate the season whenever the mood suits you! Here are a few tips that will ensure that your living tree will flourish for many more Christmases to come. Success growing an evergreen tree begins with selection. You need to purchase one that will thrive in the growing conditions that exist in your garden. Live Christmas trees must be planted soon after the holiday, so they’re best suited for areas with mild winters. Find out how big the tree will get so you’ll know the best location to plant it. To help prepare it for indoor conditions first place the tree in an outbuilding for a few days. Before you bring it inside, slip the tree into a decorative container to hide the nursery pot or balled and burlapped roots. When you do move it inside you want to make sure it’s protected from extreme conditions. Keep your tree away from sources of heat, like fireplaces and vents. And if you use Christmas lights, limit the time you have them on so they don’t heat up the tree. You shouldn’t keep living trees in the house for more than seven days and when it comes to watering, just keep the root ball consistently moist. When you get ready to take the tree back outside it will need to acclimate to outdoor conditions. Place it in a shelter, unheated location such as a garage or tool shed for several days before planting it in the garden. Now since most Christmas tree type evergreens don’t like wet feet, make sure it is planted in an area where the soil is well drained. There’s nothing quite like the aroma and look of fresh holiday greenery. 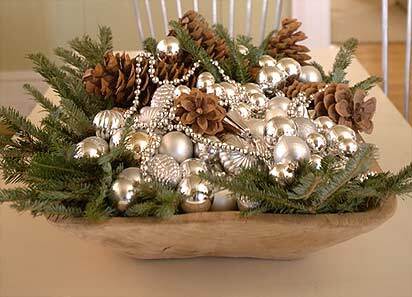 Some of my favorites are boughs of cedar, pine, and spruce along with mistletoe and boxwood. Once it is cut and brought into our homes it will begin to dry out. There are some things you can do to make the freshness last much longer. It’s all about retaining moisture in the foliage. Recut the stems and soak the greenery in water overnight. You can do this with cut boughs, garlands and wreaths. You can do this in a galvanized tub or your bathtub. For arrangements in water re-cut the stems and add glycerin to the water. This will keep the needles soft and pliable. Be generous – using 1 part glycerin to 1 part water. You can pick up glycerin at your local drug store. An additional way to keep moisture in the foliage is to spray the greenery with an anti-transpirant. This solution is available at garden centers. It will hold the moisture in and make your greenery look fresher, longer throughout the holidays. The holiday season is a special time of year. I love all the sights, sounds and aromas. I love the scent of fresh greenery both inside and outside the home. Fresh greenery, whether it’s cut from the garden or purchased, is a renewable resource and a quick way to infuse your home with that lovely holiday scent. To be “green” in your decorating look for greenery from a reliable source that sustainably harvests select bows rather than cuts a whole tree down. There are many ways to include fresh greenery around your home for the holidays. If you have a large table setting for your holiday gathering, try using a greenery mantelpiece in the center of the table. It’s the perfect height to allow guests to visit across the table. Garland made from evergreens can be used in a number of ways – down a staircase, on a mantel, or even on the outside as an entry accent. great way to apply these decorations. There are an abundance of ways to use fresh greenery for the holidays. Just use your imagination and have a little fun! If you are looking for something unique to give this holiday season, I suggest a gift from my home state of Arkansas. From tasty treats to sweet smelling soaps there is something for everyone on your list. Lambrecht Gourmet’s award winning Southern Pecan Toffee is made with roasted pecan halves, covered in rich butter toffee and drenched in imported, single origin milk chocolate. The resulting confection is a perfect balance of crisp, buttery toffee covered pecans and smooth milk chocolate. It’s a gift that will be well-received and quickly devoured! Spice up someone’s life with a bag of this fiery snack mix made with pecans, cashews, almonds and other tasty morsels. Available is Spicy Original, Hot Chipotle and, my fav, Chocolate-Laced. If you grew up in the South, chances are your family had a cast aluminum grill in the back yard. The "Portable Kitchen"€� is a classic cooker for a backyard barbeque. Durable and timeless, this grill will become a family heirloom that you pass down to your kids. Aromatique is a premier potpourri and candle maker in Heber Springs, Arkansas. Founder Patti Upton and I go way back, further than I’d like to admit. I love this orange and evergreen scent for the holidays. If there is someone on your list who is a fan of A Christmas Story, they’ll be sure to appreciate a Red Ryder BB gun. Just be sure the recipient heeds the film’s warning about shooting out an eye. Are you an Arkansas craftsperson, grower or maker? I encourage you to join ARKANSAS GROWN to help get your product out in front of consumers. And if you are a shopper, look for the Arkansas Made logo to identify locally produced goods. Check them out at www.ArkansasGrown.org. Every year I pick a Christmas decorating theme drawing inspiration from everyday items or materials from the garden. For instance, in 2010 I went all orange and chartreuse using tons of clementines and this year old fashioned tin ornaments will be my guide. One of my favorite muses was a magnolia leaf. The glossy green top and velvety brown underside sparked the idea to decorate in chocolate browns, white and silver. How do you decorate for the holidays? Do you stick with a time honored theme or do you change it up every year? In the summer a tomato cage is an unassuming garden tool that supports growing tomato plants, but in winter, it can transform itself into a holiday decoration. Simply turn the cone shaped wire cage upside down, wrap it with evergreen garlands, add lights, fruit and ribbons and place it in a container. Viola! A holiday accent for the garden is born! Start by selecting a container that is slightly larger in diameter than the wide end of the tomato cage. Fill the container with soil to within about 2 inches of the lip. Now, turn the cage upside down and place it in the container on the soil. You will begin to see the classic conical evergreen shape taking form. To steady the cage in the container you will need some u-shaped pins. You can make your own out of wire clothes hangers. Just cut a length of the hanger with wire cutters and bend it into a U. Position the pin over the bottom ring of the cage and push it into the soil. Flush out the tree shape with evergreen garland. Connect the garland at the bottom with pipe cleaners or light wire and wind it upwards around the cage, securing the end to the top. It may be necessary to attach the garland to the cage with pipe cleaners as you go along to prevent it from sagging. Alternatively you can use evergreen boughs as your greenery. For a night time glow wrap the tree with a string of lights. White will give you a classic look, but you can also opt for whimsical colored lights. Apples and wild berries will add visual interest during the day. First add the apples. Simply pierce the fruit with an ice pick and run it through with a pipe cleaner. Now tie the apple onto the tree. Repeat this process until you have an even distribution of apples. Create “bouquets” of wild berries such as China berries, nandinas or crabapples and attach them to the tree with pipe cleaner. If you are feeling especially festive and also want to benefit wildlife make some pinecone bird feeders and hang them from the tree as well. As a finishing touch, tie a holiday bow at the top of the tree. It’s just amazing what you can come up with a little imagination and a few things around the garden. On one of the shows you used a spray on holiday evergreens to keep them looking fresh longer. Was this for outdoor use only? The key to keeping greenery looking good through the holidays is maintaining moisture in the plant. Plants naturally lose water through their stems and leaves through a process called transpiration. An anti-transpirant spray such as Cloud Cover or Wilt-Pruf seals the moisture in. You can purchase these products at a garden center. Also some tree lots or nurseries will apply an anti-transpirant for you when you purchase your greenery. An anti-transpirant alone is not enough to keep your holiday evergreens looking their best. The first step is to select fresh greenery. That means good green color and very little needle drop. It’s also a good idea to soak evergreens in water over night. Completely submerge garlands and wreaths in a large tub. Before removing the next morning recut the stems under water if applicable. This step is not necessary if they were sprayed with an anti-transpirant when you bought them. If this is the case, the spray would be washed off. After soaking the greenery you can choose to use an anti-transpirant. Spray your greenery outdoors and wait a few hours after treatment before you begin decorating.